This is one of the finest upscale Atlanta golf courses and was designed by Dennis Griffiths, also known for the Chateau Elan and Georgia National golf courses. Water hazards exist on 9 holes and there are several elevated greens on this exceptional course. Holes are laid out within a thick bed of gorgeous hardwoods over rolling hills with gracious landscaping, artistic waterfalls, and distinctive stone walls and bridges. Each hole offers 4 tee boxes, and you'll find mostly generous fairways with large, fast, and true greens that are well protected and will put your short game to the test. St. Marlo offers a nice challenge even to the more experienced golfers. The St Marlo is the sister community of St Ives Country Club just around the corner. 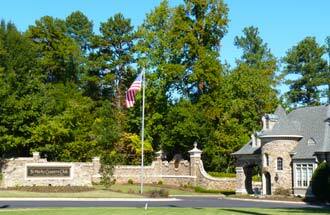 The clubhouse is a wonderful expression of beauty and is the anchor of the exceptional top rated Atlanta golf course. Being constructed on one of the highest points in the community, The St. Marlo Clubhouse offers exceptional views of the tree covered horizon. There is a junior Olympic pool with large cabana, nine lighted tennis courts, a sports field with soccer, volleyball and basketball and children's playground. There are 900+ Atlanta homes built from the early 1990s to present in St. Marlo with both traditional and European styling. You'll find all the luxury appointments you would expect with upscale custom construction. Interiors feature soaring ceilings, curved stairways with dramatic second story interior views, gourmet kitchens, theater and game rooms, and more. On the outside you'll find dramatic entrances with long, curved and circle driveways, spectacular pool areas with gorgeous waterfalls and fountains, all brought together with beautifully designed professional landscape plans. Atlanta homes here range from $500k to $2m+.